Tuesday’s ride downtown to meet the shuttle to work was a chilly one. It was that kind of cold that makes your eyes water and freeze over, the kind that makes the cold of the helmet buckle almost painful against red skin. The good thing about biking, though, is after about ten minutes, you’re all warmed up, and that takes the edge off. It took more like fifteen minutes on this early morning, but it just felt good to be back on the bike and part of the world in that way that is so very specific to being on a bike. I hit all the red lights, so it was a slow go, as it is when all of us are headed in the same direction at the same time, regardless of how we’re doing it. I snapped this picture as I waited for the light to change at Monument and Howard. These are the light rail tracks, always a special bump-da-bump part of the ride. On days when I take the bus, I’m often early and wander up and down Howard and adjoining streets. It’s so strange to me that the Howard Street corridor in downtown Baltimore runs through so many vacant, boarded up buildings. The one across this street features a great mural, but it’s that part where a mural in a central city often signifies an area that has been otherwise abandoned. That open window at the very top of the building shows not the inside of a home or business, but another bricked-off wall. Worst window ever. The light rail here was planned in the 1960s, but it wasn’t built until the late 1980s, pushed by Donald Schaefer as a way to get people downtown to the new Oriole Park at Camden Yards. It opened in April 1992, the very month the Orioles started to play there. It was built to bring suburbanites into the city center to watch baseball games, and I wonder if that’s part of why the stations between the stadium and Mount Washington run through so much abandonment, because these other areas aren’t meant for those folks, but for the people who actually live and work here, in the in-betweens. And then the light turned green and I was on my way, up this hill and down through Lexington Market, dodging a zillion pedestrians–that place is alive in the mornings, I tell you–and over to the covered bike racks at the med center. The ride home that afternoon was all sunshine and chilly blue skies, and spring was already on my mind. 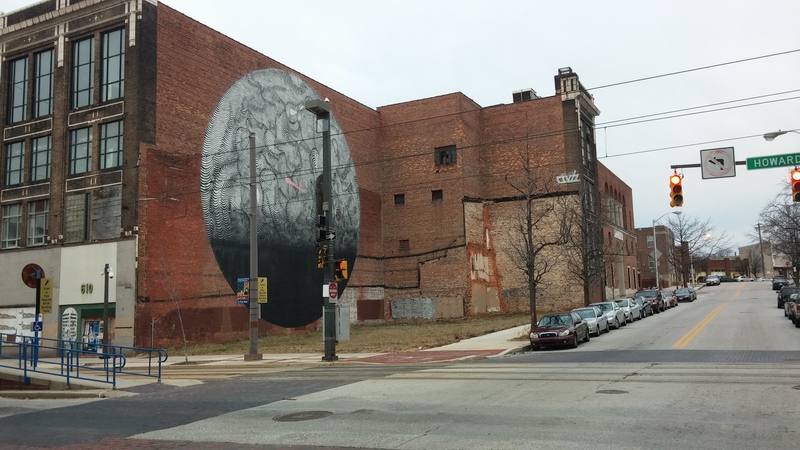 This entry was posted in blight, public transportation and tagged Baltimore, blight, Downtown, light rail, Orioles Park at Camden Yards, public transportation. Bookmark the permalink.